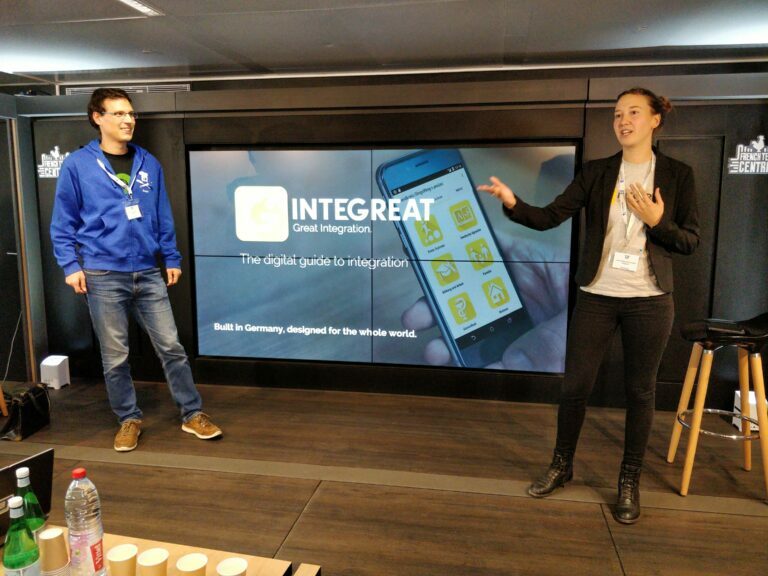 As one of the few German projects we were on stage at the Techfugees Global Summit 2018. We were the only German team to take home a prize: The 1st place in the category “Access to Rights & Information”. After several jury rounds, the winners of the Techfugees Global Challenge competition were announced at Station F in Paris. The winning projects were selected by an international jury of experts from more than a hundred applications. The competition was open to innovative projects supporting Techfugees’ five priority areas: Access to rights and information, health, education, work and social inclusion. Techfugees is a nonprofit organization that brings the global technology community together to support the needs of people on the run. Today, it is estimated that one person is displaced every two seconds. More than 68 million people worldwide are prevented from returning home, including refugees, asylum seekers and internally displaced persons in their home countries. Founded in 2015, Techfugees has grown into a community of 18,000 innovators from around the world who attend hundreds of special events each year. Headquartered in London, Techfugees Centers are active and evolving worldwide, from San Francisco to Sydney.